Minnkota Multimedia Specialist Kevin Jeffrey and I hopped in the Bolt and took a drive down to Fargo and West Fargo on Monday morning. Our main goal was to check out the work being done to upgrade the substations that help power those growing communities; the projects are coming along wonderfully. However, we took the opportunity to buzz around to some of the main public Level 2 charging stations in town to see how accessible they were, if we had to pay to use them and, the biggest inquiry, if they even worked at all. Spoiler alert: we had some pretty good luck. 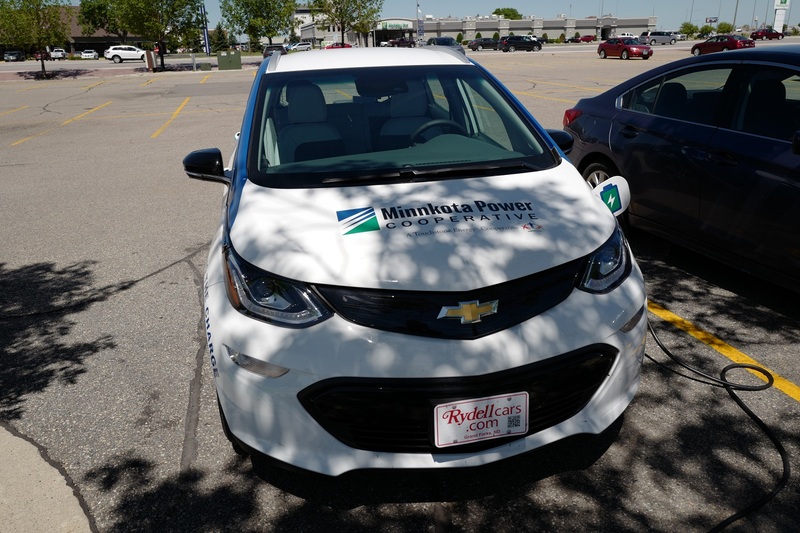 Our first stop was on the far south side of Fargo at the Happy Harry's Bottle Shop off of 52nd Ave. S. The Schneider Electric brand station had two free charging cables. The one I used to plug in looked like it hadn't had much usage - I had to knock a few spiderwebs off of it. But after connecting our EV, our green dash light started to blink, indicating we were in business. We hit the Happy Harry's Bottle Shop charging station just as they were opening their doors to customers, so we had no problem getting a parking space. We didn't have time to add any substantial mileage to our charge at Happy Harry's because we were on our way to a story interview. 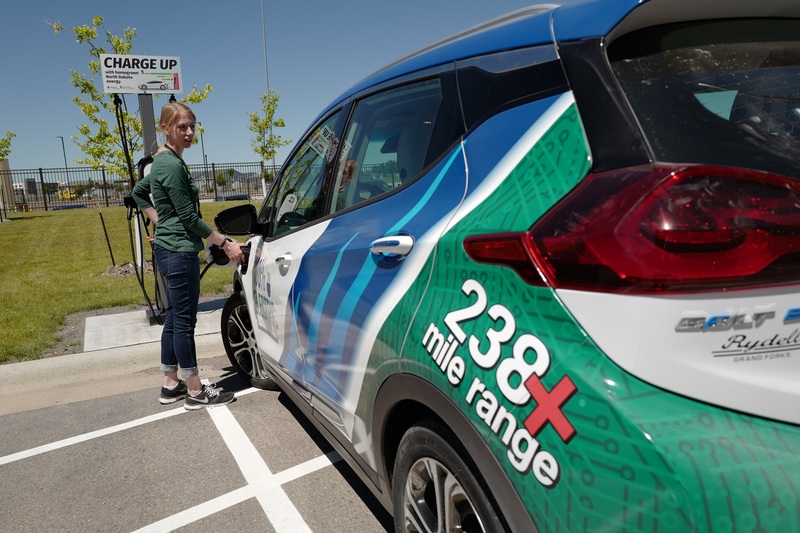 After we chatted with some of the Minnkota crew at the Frontier substation in South Fargo, we headed to the Element Fargo, a newer hotel in West Fargo that offers a free Level 2 charging station with both Tesla and J-1772 charging capabilities. The parking space was open, so we plugged in with no issues and crossed the street to grab some lunch at a local restaurant. When we came back 45 minutes later, we had gained an estimated 19 miles of charge. Not bad! After lunch we logged another interview and shot some photos at the Grager substation in West Fargo. But there were still a couple of Level 2 charging points that I wanted to check out, so we headed to the new Sanford Health Medical Center, just south of Interstate 94. 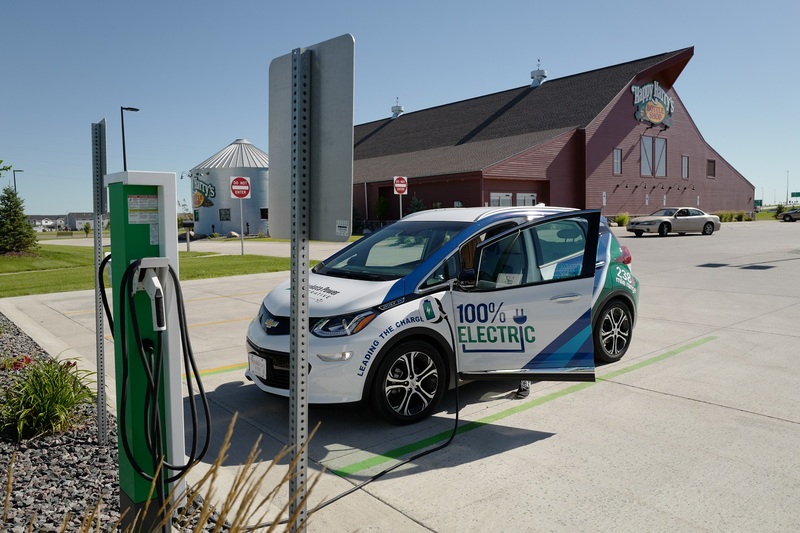 This free Clipper Creek charging station, which was supported in part by our member cooperative Cass County Electric, is set up near the northwest entrance of the building. The parking spaces were open, so we pulled in and plugged in with one of the two J-1772 chargers. Again, we had no issues with this pit stop. My confidence in Fargo's EV charging infrastructure was growing with every blinking green light. Every time I plug into a new Level 2 station like this one at Sanford Health, I watch for that blinking green light on the Bolt's dash. When it lights up, it's like Christmas morning. We didn't need a full charge to get back to Grand Forks, so we swung over to the West Acres Shopping Center to try out one final charging station. This was another free Clipper Creek station sponsored in part by Cass County Electric. And guess what? This one was open and worked perfectly! 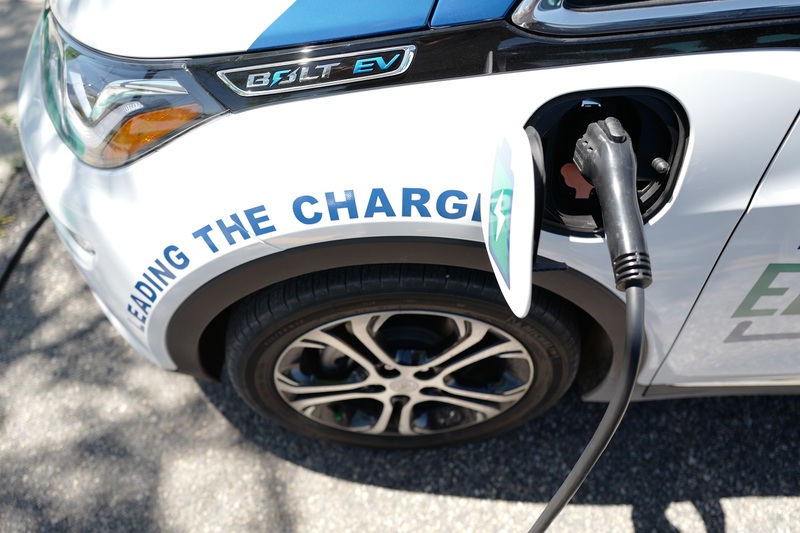 There is only one plug on this station, but it's been announced that mall will soon have additional J-1772 chargers AND a Tesla Supercharging station. So buckle up for that, you EV-driving shopping fanatics! There was just one spot for a plug in at West Acres Shopping Center (and we nabbed it), but there are many more to come this summer. There are also a small handful of auto dealerships in the Fargo area that offer EV charging, so check out PlugShare.com to check those out. Overall, our quick pit stops were incredibly successful. I'm excited to see more communities in North Dakota and Minnesota embrace EV technology and invest in even more options to plug in!